The Horry County Democratic Party welcomes your inquiries. Here are some common questions we’re asked. If you have other questions or want more information, please do not hesitate to Contact Us. There are several ways to register: on-line, in person, by mail, fax or email. The Horry County Voters Registration office at 1515 Fourth Avenue in Conway is open Monday-Friday, 8am–5pm. The staff is always ready to assist you. Call (843)915-5440. You can find your precinct name, number and voting location your Voter Registration Card. 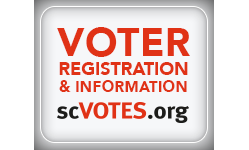 You can review this list of Horry County Polling Places and you may search for your polling location by visiting scvotes.org. If you have moved, be sure to change your address with the Voters Registration Office in Conway. Even a move across the street could change your precinct and voting district. How do I find information about local candidates and elections? Please visit our website frequently to learn about local Horry County candidates and elections, or sign up to receive our periodic newsletter. You may also check out our Events Calendar for registration deadlines and election dates. I’d like to work at the polls on Election Day. How do I do that? A registered voter in Horry County can be a Poll Worker (trained and paid by Horry County) or serve as a Poll Watcher (volunteer observer trained by HCDP or a candidate’s campaign). We encourage all Democrats to consider participating as either a Worker or Watcher to help ensure that every eligible Horry County resident gets to vote – and that each vote is counted. Let us know if you are interested via our Volunteer form. How can I get involved in Horry County Democratic Party activities? There are so many ways to get active with HCDP! It is easy to find a good match for your interests. You may choose to help with voter education and registration during area festivals and other public occasions. You may assist elected officials and candidates with their campaigns or become a Precinct Officer and reach out to Democrats in your neighborhood. Support and advocate for the local Democratic causes that are important to you. Of course, we always need help with fundraising and various other volunteer activities. With Democratic clubs and groups all around Horry County, you can find a group close to your home. Visit our Get Involved page for more suggestions, and check out our Events Calendar for upcoming events. Sign up for our Newsletter to receive periodic email updates. Who can be a member of the Horry County Democratic Party? Our Party is open to all who share our principles and values. There is no “membership” in HCDP – no dues, fees, or membership levels. HCDP is a proudly diverse mix of multi-ethnic, multi-racial, multi-generational folks. We are students, workers, and retirees from all walks of life and backgrounds. Come to an event or meeting near you – you are sure to find like-minded Democrats! Where can I learn about current Democratic candidates? Our Candidates section shares information about who is running for office in Horry County. Most candidates have their own websites and Facebook pages, where you can learn about their positions on various issues. I am considering running for office. How should I go about doing it? Running for office is a huge undertaking. If you are an Horry County Democrat who shares our principles and values, we will do everything in our power to help you launch and run a robust campaign. We suggest you consider which public office best suits your skills and background, and then develop a platform to showcase your ideas and convictions. Find out more on our Run for Office section, or Contact Us for more information. I would like to work for a particular candidate. How do I make contact with that campaign? Candidates always need support with everything from phone banking, canvassing neighborhoods, to hosting fundraisers. If you’re willing to work, they will be glad to have your help. You can find contact information on Our Candidates page, or visit your candidate’s individual website or Facebook page. To find local campaign events, please visit our Events Calendar. What issues are the focus of the Horry County Democratic Party? Here at the local level, HCDP is currently concerned with issues ranging from poverty and public transportation to healthcare and the environment. Learn more on our Issues Page. HCDP fully supports the national Democratic Party platform. Of course, individual Democrats support a wide range of multi-faceted issues, and we may not always all agree. Can HCDP help me with a particular issue or concern? If there’s something about which you feel passionate, and you believe it aligns with our party values, then please contact us. Our governing body – the HCDP Executive Committee – determines whether and when to take action on a specific issue. We may be able to put you in touch with others who share your passion and commitment. If you have any questions or would like more information about the Horry County Democratic Party – or wish to learn more about any Democratic candidates in South Carolina – please do not hesitate to Contact Us.